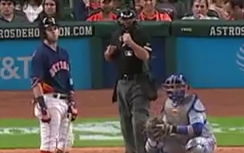 HP Umpire Rob Drake ejected Astros RF Josh Reddick (strike three call; QOCY) in the bottom of the 9th inning of the Blue Jays-Astros game. With none out and one on (R1), Reddick took a 2-2 slider from Blue Jays pitcher Roberto Osuna for a called third strike. Replays indicate the pitch was located over the outer edge of home plate and waist-high (px -.758, pz 3.224 [sz_top 3.275]), the call was correct. At the time of the ejection, the Blue Jays were leading, 6-3. The Astros ultimately won the contest, 7-6. This is Rob Drake (30)'s first ejection of the 2017 MLB regular season. Rob Drake now has 5 points in the UEFL Standings (1 Prev + 2 MLB + 2 Correct Call = 5). This is the 125th ejection report of 2017. This is the 54th player ejection of 2017. Prior to ejection, Reddick was 0-5 (2 SO) in the contest. This is Houston's 3rd ejection of 2017, 4th in the AL West (TEX 6; OAK, SEA 4; HOU 3; LAA 1). This is Josh Reddick's first career MLB ejection. This is Rob Drake's first ejection since April 17, 2016 (Justin Upton; QOC = Y [Balls/Strikes]).